Students can take the exam in one or both windows. Best score out of the 2 attempts will be considered for admission. Hi students! The Ministry of HRD on 7th July declared that the JEE Main and the NEET exam will both be held twice in one session, and the organizing committee responsible for both these exams will now be the newly formed body – the National Testing Agency, instead of the CBSE. Disclaimer: NTA would now conduct the NEET 2019 only once a year, The HRD Ministry has took the decision against its previous announcement which declared that NEET 2019 will conduct twice a year in online mode. The examination would now be conducted in the same pattern as earlier, in pen and paper mode on May 5, 2019 by NTA. A lot of JEE aspirants have been asking us how this announcement would affect them. We are happy to tell you that this announcement is great news for all students. Let’s have a look at everything you need to know about this change, and how it affects you. Which exams will be organized and conducted by NTA? What will be the mode of the exam? The exams will be conducted in computer based mode only. This means that there will be no offline papers anymore. 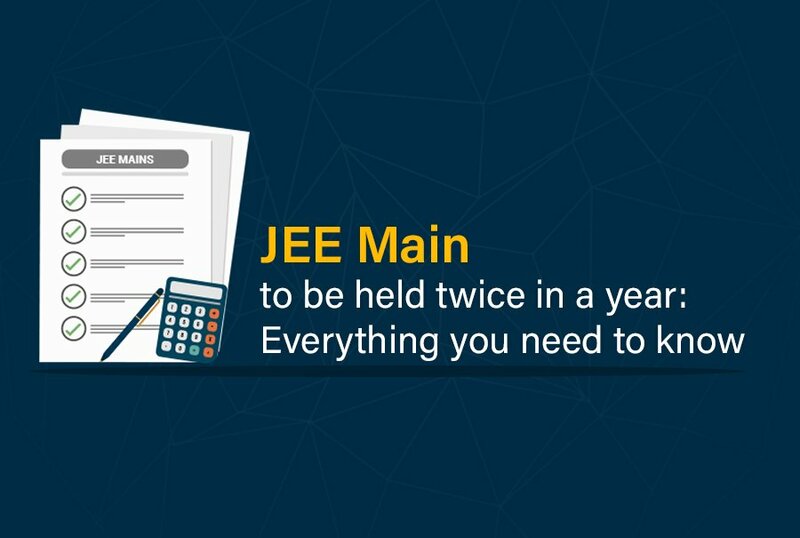 How many times will the JEE Main be conducted in one academic year? Starting from 2019, this exam will be conducted twice a year. The main benefit of this change is that students have two chances to take these examinations in the same year. The JEE Main will be conducted in the months of January and April. In both phases, there will be 8 different exam dates, and students will be able to choose one out of 8. The collated result of each phase will be released in the next month after the exam. For example, in the Jan phase of JEE Main, there will be 8 dates out of which candidates can select one. The collated result of these 8 sittings of JEE Main January phase will come out in February. Every student will be allowed to take the exam twice in 1 year: The better score will be taken during allotment of a college seat. This means that you will get 2 chances to show your caliber. You will not suffer due to any unfortunate circumstances that might affect your performance in one of the exams, because you can always compensate in the other paper. In fact, the first paper will tell you weaknesses that you can work on before the next paper. Students have been asking us: which of the two phases you should choose to appear for? We recommend that you give both attempts to maximise your chances. There is no reason to not take the exam twice. The only thing to note here is that you will need to apply for the 2 phases separately. So you will make sure that you don’t miss the application deadlines, both times. No more OMR sheets. OMR sheet filling was a tedious task. It took a lot of time and the chances of making a mistake were high. You had to answer correctly in one go, or the answer would stand cancelled. Now that the exam is online, students will be able to review their answers and change the response if the want. Exam dates have been chosen well. Note that until this year, competitive exams and board exams were almost back to back. Students struggled with balancing the prep for both. The good thing is, that with the first phase of JEE getting over in Jan, students will get some time to breathe before taking the board exams. Also, students taking JEE can give equal attention to both exams by focusing on first phase of one exam, and second phase of the other. Syllabus and format remain the same: While many things have changed, the biggest worry for students was exam syllabus. The good news is that the syllabus, question formats, language and fees is NOT going to change. Students taking the exam in 2019 do not need to worry about their hard-work until now going to waste. NTA has been constituted to improve the quality of the exam process. This will mean more standardisation, and ultimately better question papers. Avanti can help all of you use this online exam format to your advantage. Avanti’s online testing platform is identical to the JEE testing platform– Avanti’s online testing platform is designed to mimic the online platform used by CBSE for online exams such as JEE Main. Since the exam will be online only now onwards, and exam strategy and time utilisation are different for offline and online exams, students will need a lot of practice on it. Avanti’s testing platform will help you get familiar with attempting exams online. Avanti conducts standardised tests that are of the same pattern as JEE – We anticipate that NTA will design 8 standardised tests for every phase of every exam. All these 8 tests will be of the same level, and using the same concepts, so that the performance of students can be compared with ease. Avanti has an experience of 5 years in standardised testing. Our question curation and test creation process makes sure that all our tests have a strong correlation with the JEE exam level. Avanti provides a detailed report on student performance – Avanti testing platform gives immediate comprehensive performance diagnosis to students. This includes personal SWOT analysis, performance comparison against competitors, and question-wise scope of improvement. Such a level of detail helps the students in developing an exam strategy that captures the low hanging fruit and maximises score. Flexibility – Avanti’s online testing platform gives students flexibility to attempt the test series at a time that suits them. It can be adapted to help you whether you take the exam in the first phase, the second phase, or both phases. If you want to get maximum practice for your exam, click on the link given in the description below to schedule a counselling call with us. Our experts will discuss your goals with you and guide you in achieving them through the Avanti online testing platform. Stay tuned to keep hearing from us on this news. Happy learning!